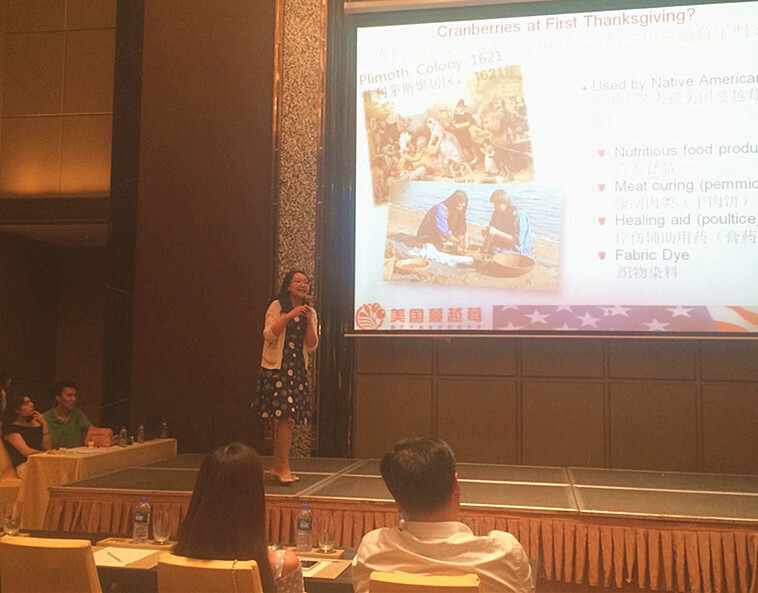 In July, CMC cooperated with Sino-America Baking School holding cranberry filling developing seminars in Longyan, a city in Fujian province on the 7th and Shantou, a city in Guangzhou on 19th. These two cities are third-tier cities in China, where cranberry awareness is not as high as first and second tier cities. Two seminars aim to educate local food manufactures of U.S. cranberry knowledge and its application in filling so to expand the market of cranberry in food manufacture industry in China. The seminar in Longyan was held by Fujian Longyan Shun Ming Trading Company, which is a distributor of SABS cooperative company Guang Da Xiang Food Company based in Fu Jian. 500 bakery store owners, bakers and food manufacture owners joined this seminar. Mr. Zhou Maofa, president of SABS, and also vice president of China Association of Bakery & Confectionery Industry delivered a speech on cranberry and bakery industry. Cranberry harvest video was also played. In addition, he also introduced 8 cranberry fillings that SABS developed to the audience, telling them the creativity and uniqueness. U.S. Cranberry also had a small table alongside seminar venue, where 8 cranberry filling samples are presented, 12 tasting samples were displayed for tasting. The 8 cranberry fillings were respectively Wine Cranberry Filling, Dorayaki Cranberry Filling, Momoyama Cranberry Filling, Cranberry and Green Bean Filling, Cranberry and Red Bean Filling, Cranberry and Fruit Filling, and Cranberry Filling, and Cranberry Sauce Filling. 12 products included seven kinds of mooncakes, four kinds of Chinese dim sums, and one Macaron. These tasting samples were quite popular among the participants, and the unique cranberry flavor had attracted many food manufactures’ attention. Many of them would like to purchase these cranberry fillings for their own factory. A similar seminar was also held in Shantou by LI Ji Trading Company, another distributor of SABS cooperative company Guang Da Xiang Food Company based in Shantou. This seminar had about 150 local food manufacture owners, bakers and bakery store owners to join. SABS president Mr. Zhou Maofa was firstly delivered a speech about current bakery developing situation and trend in China, Christina Chen, representative of CMC gave a presentation of cranberry, including the history, the nutrition, product variety etc. Ms Xu Yinghua, Director of SABS introduced 8 cranberry fillings, including their creativity, and unique flavor. In addition to presentation, U.S. cranberry also had a small table on the side of the seminar venue, where 8 fillings were presented, and 12 products were displayed for tasting. Audience in Shantou showed great interest in cranberry fillings. Many of them tasted each filling sample and asked questions of how to deal with cranberry into the fillings. The two seminars in third tier cities are of great success. Cranberry fillings seem to have a great potentiality in food manufacture industry.